Of all genres of music, especially metal, "progressive" is a genre tag that, over time, has constantly expanded its grey area for interpretation. While it's now commonly assumed to be a genre where technically proficient musicians play concept-albums while encompassing sporadic tempo shifts, progressive music can be better thought of as more of a pushing of boundaries. By incorporating unfamiliar elements or creating a new combination of pre-existing ones, this expanding of horizons is the bedrock of what it means to be progressive as a band. 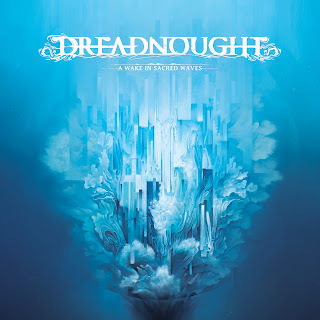 Now, the whole concept of progressive music as a philosophy versus a rigidly defined musical genre is a rabbit-hole of a conversation that would best be served as the central focus of its own series of articles, but it's these kinds of thoughts that traversed through my mind as I listened to Dreadnought's second album, Bridging Realms. Making my year-end list for 2015, the album harnessed the power of soft female vocals, black metal shrieks, blast beat drumming, pianos, saxophones, and everything that could be thought of being in that vast in-between. Denver's experimental foursome now returns with A Wake in Sacred Waves, an album that dials in their craft, takes their sound to new monumental heights, and, ultimately, will be the album that establishes them as a progressive metal force. "Vacant Sea" opens the album, boasting the dual nature of Kelly Schilling and Lauren Vieira's vocals; first with a soft female allure and then, as the gradually ascending piano scales and distorted guitars kick in, with powerful screeches. This 17 minute epic is a great demonstration of the expansiveness of Dreadnought's sound. Perhaps the most interesting element are the keys that have a church organ-like quality that are used as both a huge chord-backing emphasis as well as a swirling riff machine unto itself. Also thrown into the mix is a saxophone that smoothly hangs in the background of the track's slower transitional segment. "Within Chanting Waters" immediately hones into the band's heavier sensibilities. Droning guitars chug along with blasting drums, giving the track's overall tonality a bit more of a bite. The adventurousness of the backing piano lines and vocal melodies are still kept very much in tact, however. The end of the track also features an amazing melding of harsh screaming and boisterous guitars to create an unforgettably immense wall of sound. While the album's first two tracks offer plenty to enjoy, the last two tracks are where A Wake in Sacred Waves truly shines. "Luminous Scale," the shortest track on the album (but still over 10 minutes), features the album's most dynamism in the vocals department. The vocal melodies' inflection, whether actually sung or screamed, are executed with such swagger that it's hard not to be pulled in by them. Combine that with a catchy guitar riff that is built upon in the opening few minutes of the song and you have a track that you'll be quickly marking with the "repeat 1" option on your music player of choice. The song outros on a more peaceful note before the album's bookend, "A Drifting Reign," roars into a powerful cascading of guitar distortion. While these opening guitar chords, and variations thereof, are the primary drivers of the track, they are given another level of depth with the piano. These piano sections never steal the limelight from the rest of what's going on, but their inclusion builds a necessary tension and sense of anticipation that makes a damn impressive apogee to the album. Despite not having any obvious musical through-lines, A Wake in Sacred Waves ends just as it started; with serene female vocals, a rather nice touch. Harking back to my opening bit about progressive music, the spirit of "being progressive" is kept intact by being willing to push forward into different territories. Especially with so many options available in today's musical landscape, to stand-out of the pack while also pushing into these different territories is impressive, to say the least. Dreadnought has done exactly this with A Wake in Sacred Waves. The elements that comprise the album's sound aren't necessarily unheard of, but the way they're incorporated with each other certainly gives the band an identity unique enough that I can confidently say it's unlike anything I've ever heard. A Wake in Sacred Waves proves that you don't have to a band full of musicians constantly playing their respective instruments at blistering speeds to create something that's forward-thinking and even more importantly, fun to listen to.